Today was my first in Child Custody Court helping to mediate as part of my volunteer work with the ADR Clinic at the NC Central University School of Law. John and Jane Doe have been divorced for 2 years and have 4 kids between them, ranging in ages from 22 to 12. They’re both middle-aged people, intelligent (both employed as teachers actually), seemingly rational… and have been to court many, many times over those 2 years. Yesterday they had a day-long hearing over a new child support agreement; they’re coming back next week to dispute custody. The case today was solely to discuss unreimbursed medical expenses. Both of the parties were insanely difficult to work with. John’s first words in the mediation were that he understood compromise had to be involved, and the only way he was budging was if “miracles happen.” He then said the only reason he was participating was because the court ordered the mediation, but he’d prefer we just declare an impasse immediately and let the judge resolve everything. Three hours of mediation, dozens of snarky comments to each other and to the mediators, a subsequent court hearing to secure judicial approval of the agreement,2 all over $31.03. Had these two people — educators! with attorneys! — just had the maturity to deal with each other with some modicum of civility, they could have resolved this issue without ever coming to court in a proceeding that cost the taxpayers as much in court personnel salaries, heating/lights, etc as the amount in dispute. For comparison: although my mediation work is pro bono, had this been a mediation in civil superior court it would have cost $600 ($150 administration fee + $150 per hour for labor). I’m making an exception today, though, because this dovetails with my comments to you about Facebook and overshare in last week’s TDot’s Tips entry on tightening up your digital life. Bowes’ actions also mean people who had set their privacy settings so their names did not appear in Facebook’s search system can now be found if they were friends with anyone whose name was searchable. On his website, www.skullsecurity.org, Bowes said the results of his code were “spectacular,” giving him 171 million names of which were 100 million unique. “As I thought more about it and talked to other people, I realized that this is a scary privacy issue. I can find the name of pretty much every person on Facebook,” he wrote. He said he discovered the top first name in the list was Michael, followed by John, David, Chris and Mike. The top surnames were Smith, Johnson, Jones, Williams and Brown. 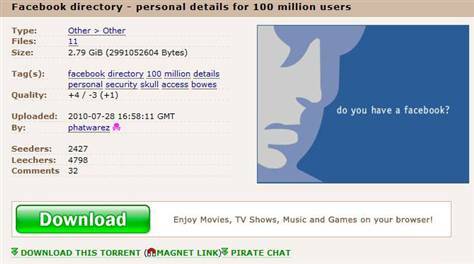 Some users of Pirate Bay shared his concerns. In a statement emailed to msnbc.com, Facebook agreed, saying the information on the list was already available online. “People who use Facebook own their information and have the right to share only what they want, with whom they want, and when they want,” it said. “Our responsibility is to respect their wishes. In this case, information that people have agreed to make public was collected by a single researcher. This information already exists in Google, Bing, other search engines, as well as on Facebook,” the statement added. The comments in this article notwithstanding, go through your privacy settings and lock down anything in your profile that you may not want permanently open to the public. It’s true the information that was public when this user-created database was compiled will still be in it — but (i) relatively few people will know about this database so the threat should (hopefully) be limited, and (ii) locking your profile down now will prevent any future access to anyone trying to create a similar or updated database of this information down the road. That’s it for today. Hope all of you are having a great week! After trying to get the previous batch of late entries edited and posted, I ended up falling behind on this week’s entries… which are now finally all edited and posted as well. Hopefully this will be the last backlog any time soon Enjoy! I had a random urge to look at my calendar today, since I’ll be in court 4 times over the next 9 days to wrap up my mediation requirements for the ADR clinic at NCCU Law. After those requirements are done I’ll be officially finished with summer school… but then start helping out with 1L Orientation the following Monday. I started reading some of the economics books that were out at the time (I’ll confess to even reading a Paul Krugman book or two) in addition to the classics like The Wealth of Nations. Then at some point I read Economics in One Lesson by Henry Hazlitt which, the title of the book notwithstanding, is a comprehensive, accessible, and mind-changing analysis of economics and government. Anyhow, at some point while roaming around the web today I saw this video among the “related videos” links you get on YouTube. It reminded me of the Socratic method of law school a bit… but also reminded me that I miss Milton Friedman and economists who can engage their audiences. Have a great evening y’all! I’ve mentioned in a few previous entries that I’m volunteering with the Alternative Dispute Resolution clinic at the NC Central University School of Law. The course requirements include mediating about a dozen cases in Wake County District Court, creation of sample documents used by mediators in the field like Agreements to Mediate, a presentation on an ADR topic of interest (mine was plea bargaining), and 3 separate papers critiquing how some of those dozen-ish cases were actually mediated. So Professor ADR sent me an email wondering where they were. And I gave serious consideration to crafting some kind of plausible excuse to justify my failure. But the truth is I forgot, so I sheepishly confessed my sin in a response email and pleaded for mercy. I learned that earlier today when I made a comment via Twitter and got into a pair of lengthy back-and-forth discussions with one of my old roommates at N.C. State and one of my colleagues at NCCU Law. Apparently my opinion was sufficiently outrageous that several third-party observers of our conversations felt the need to argue with me via other channels… only to later concede they hadn’t actually seen anything beyond what was reported on CNN or MSNBC. If you’re not familiar with the incident and disregarded my opening warning to skip the rest of this entry (last chance! turn back now! ), it all began on Monday with this entry at BigGovernment.com, a website run by conservative activist Andrew Breitbart. It features commentary from Breitbart claiming the NAACP is hypocritical on race issues and is coupled with two clips of Ms. Sherrod speaking at the local NAACP’s Freedom Fund Banquet. In the clips Ms. Sherrod tells a tale of being approached by a white farmer in need of help to save his farm from foreclosure, and she “didn’t give him the full force of what [she] could do” because he was white. The moral of her story was her later realization that issues of race are often more accurately characterized as issues of class, or in Ms. Sherrod’s words “it’s about poor versus those who have”. Within a day Sherrod was forced to resign by Secretary of Agriculture Tommy Vilsack and was denounced as a racist by NAACP President Ben Jealous1 — both clearly overreacting out of fear they would be seen as defending reverse racism. Then everyone reversed course a day later, claiming Ms. Sherrod’s remarks were taken out of context, and the NAACP leadership even having the guile to claim it was “snookered” by Fox News (which hadn’t run anything about the story until after Ms. Sherrod was fired by Vilsack and denounced by Jealous) before posting what the NAACP claims is the “full” video on its website. The airwaves are now replete with everyone hurling the “racist” label at everyone else. Every law student in the country is familiar with the twin concepts of Statutes of Limitation and Statutes of Repose. 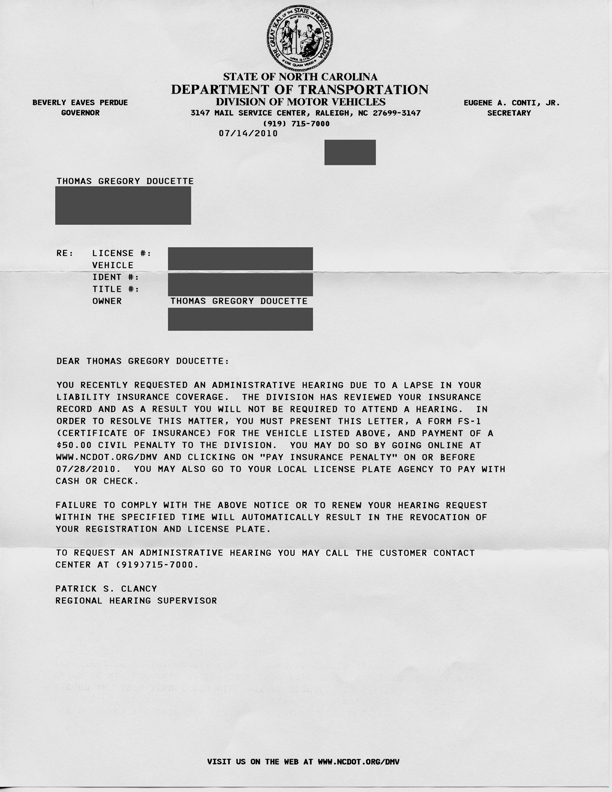 For the non-law-inclined, in overly-simplified terms a Statute of Limitation sets a deadline for filing a lawsuit once you realize you have a claim; they’re designed to prevent a Plaintiff from “sleeping on his/her rights” to the unfair detriment of the Defendant, who may not be able to mount a defense if records have been disposed or other evidence is lost. In North Carolina, for instance, the statute of limitations for most offenses is three years with one-year extensions in certain circumstances (such as when you don’t discover the injury until after the SOL date has passed). In equally over-simplified terms, a Statute of Repose is kind of like a SOL on steroids. After the deadline set in the Statute of Repose you can’t file a lawsuit at all under any circumstances, even if you didn’t know you had a claim. These are most common in product liability cases, where a SOR is commonly set based on the date the product was manufactured or the date it was initially purchased by a consumer. Both the SOL and SOR are essentially decisions by society (through our legislators) that certain offenses are more or less significant than others. Again using NC as my example, most misdemeanors have an SOL of 2 years while violent misdemeanors and felonies have no SOL at all (you might have heard the line in Law & Order episodes or other crime dramas that “There’s no statute of limitations on murder” in most jurisdictions). Even if we assume the very worst about Ms. Sherrod — that her videotaped admission of not providing the “full force of what [she] could do” was true and a result of her personal bias toward the man seeking her help — it was an admission about something that happened over 20+ years ago. There are numerous crimes that society has decided aren’t significant enough to be prosecuted after 20+ years, along with nearly every tort in nearly every state. Had Ms. Sherrod committed professional malpractice in any other profession, the Statute of Repose in North Carolina would have passed in the mid-90s. Unless there was some kind of indication Ms. Sherrod was still engaging in this kind of discriminatory conduct, as opposed to simply relating a story of personal growth, this particular instance in the 1980s should have been left alone as a dead issue and her job security shouldn’t have even been questioned. Instead she was thrown under the bus by her government employer and vilified by the NAACP out of fear of the political fallout if it appeared they were supporting reverse racism. In a predictable fashion that only politics can provide, once the “full” video was posted the ensuing political commentary became totally unhinged from reality. Commentators started insisting that not only were Ms. Sherrod’s remarks “taken out of context” but that she had actually done nothing wrong in the first place. Both claims make no logical sense. If you haven’t already done so, go back to those entries I listed in #1 above — read the entry on BigGovernment.com and its video snippets, then watch the “full” video on the NAACP website. If you just want to listen to the farm-related story in the “full” video, it’s from 16:23 to 21:26. Even in Breitbart’s original entry (the one that has since been blasted by the White House and the NAACP alike as “selectively edited”) it’s clear to even a cursory observer that Ms. Sherrod’s story is one of personal growth. She was admittedly derelict in her job duties because of racial bias, but later learned “it’s about poor versus those who have” as opposed to race. That context is right there at the 1:44 mark in BigGovernment.com’s first clip, which is the same as 18:23 in the NAACP’s “full” video. Where’s the lack of context? The idea that her conduct was exemplary is also bizarre. Ms. Sherrod says very clearly and unambiguously that she “didn’t give him the full force of what I could do. I did enough.” That alone was bad enough, but she compounded her original failing by voluntarily picking out a white attorney for the farmer to use for filing bankruptcy since she figured “his own kind would take care of him.” It’s right there at 1:26 to 1:43 of the BigGovernment.com clip, which is the same as 18:06 to 18:21 of the NAACP’s “full” video. It’s roughly akin to me (the farmer) drowning in a pool (the farmer’s debt), but because the lifeguard (Ms. Sherrod) is biased against fat (white) people and assumes I’ll float (escape foreclosure), he (she) decides to throw me a defective life preserver (Ms. Sherrod’s limited help) instead of diving in to rescue me (the “full force of what [Ms. Sherrod] could do”). Then when I’m still drowning he (she) throws a defective life jacket (the incompetent white bankruptcy attorney). Then when I’m a few seconds (hours) from death (foreclosure), he (she) calls over to another lifeguard (the black bankruptcy attorney) who dives in for the rescue. Generally when a government actor has done something wrong, there is no tort liability for negligence against them when it’s an issue of nonfeasance, meaning the government actor simply has failed to take an action they were supposed to take. Tort liability for negligence typically does arise, though, when it’s an issue of misfeasance, meaning the government actor has taken some affirmative action but did so negligently and harmed the injured party as a result. I’m sure Ms. Sherrod is a nice lady, and I take her at her word in the speech that she no longer has her former misguided views on race that led her to not fully help a white farmer and then pick out a deficient white attorney for him. She shouldn’t have been fired. But that doesn’t mean she should be deified instead. There’s not much to say here other than wondering what’s going on behind the scenes. The “full” tape posted by the NAACP pretty clearly is not the “full” tape. If you watch it closely you’ll notice an obvious cross-fade at the 21:00 mark where something was clearly cut out. Why would you post something for public review and claim it’s something it isn’t? A bigger question, for me at least: why has no one in the media noticed the missing snippet, instead breathlessly repeating that it’s the “full” tape? I’m convinced everyone commenting on this manufactured controversy has lost their minds. To my fellow conservatives: do any of you really think pointing out racism in the NAACP would somehow mitigate racism (if found) within the Tea Party movement? Supposedly that was Andrew Breitbart’s motivation in posting his initial entry on Monday, but I vaguely recall something called the “two wrongs make a right” fallacy — which I also vaguely recall being mentioned by Jesus himself in the Sermon on the Mount (see Matthew 5:38-42). Following up on that question, do you think it’s wise to issue an open challenge to folks to “prove” racist elements in the Tea Party? In Wake County alone, I’ve seen Republicans claim a black sheriff was releasing detainees because of their race, and I’ve seen Democrats justify the liberal Nanny State by claiming blacks weren’t intelligent enough to take care of themselves. I’d venture to guess that you can find racists in any mass movement in the country. It seems kind of dumb to instigate that discussion — especially when, if someone were to be pointed out using racist language, they’d just be dismissed as not being a true representative of the movement. And to my liberal colleagues: do any of you really think government personnel are justified if they “didn’t give [someone] the full force of what [they] could do” as a result of personal bias, as long as they learn from it after the fact? Government employees at the local, state, and federal levels who merely “did enough” to barely comply with the letter of the law were often rightfully denounced during the Civil Rights era, and yet now one is being exalted because she had an epiphany after the fact. Following up on that question, do you think it’s OK for the government to abuse one of its employees by forcing them to resign over a decades-old controversy? Claim remarks were taken out of context all you like, the fact of the matter is a good chunk of the liberal establishment in this country threw Shirley Sherrod under the bus without any investigation or critical evaluation because they were worried about electoral repercussions. The people who supposedly believe in defending “the little man” instead smeared one for the sake of political expediency. To the media: who told you electing Barack Obama was going to lead to some “post-racial” society where race was no longer a topic of controversy? I’ve read this in so many news stories it’s comical. Huge chunks of the country don’t pay enough attention to politics to even know who the President is, much less that he’s black, much less that his blackness is supposed to influence their opinions on race. Your collective obsession with the transformative power of Big Government blinds you to the fact the overwhelming majority of voters and taxpayers prefer being able to go about their daily business without government intrusion — and that as a result the government has a very limited ability to shape their beliefs. I’ve got a litany of problems with President Obama’s politics, but the fact he didn’t usher in an illusory “post-racial” society isn’t one of them. And to everybody: what exactly have we gained from this manufactured controversy? Sure we’ve “gained” a bunch of people getting pissed off at a bunch of other people and vice versa. And we’ve “gained” a fresh lease on life for a lot of really worn out political analogies (e.g. that opposing the unchecked expansion of a clearly incompetent federal government is tantamount to racism). And we’ve “gained” a collective recognition of the obvious point that we still live in a society where race is a Big Deal™. But beyond that, this entire pseudo-scandal has been a waste of everyone’s time… and only highlighted the abject foolishness that now passes for racial discussion. That’s it from me — I promise promise promise you this isn’t going to become a political blog, and I’ll have something law-related to write about soon Thanks for enduring the rant, and have a great night! Even though I can’t seem to get mail from the NC DMV, one thing I’ve noticed over the past few days is a string of letters from the federal government about my student loans. I got all of these today, and that’s on top of 4-5 I got last week. Did they say anything interesting? Billing notices maybe? The semi-annual notices on how much interest has accrued, perhaps? 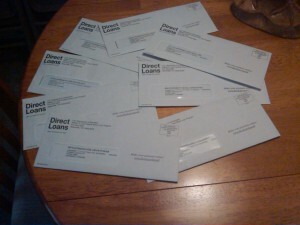 Each letter just noted that one particular student loan or another had been deferred since I’m still in school. “But TDot,” you ask, “do you really have 12 different student loan accounts with the federal government?” No I don’t… most of the letters were duplicates of each other. In the stack in this photo, these are all deferment notices for just two accounts, with only the date stamps being different between them. I wasn’t a fan of the Three Stooges1 deciding to nationalize the student loan industry, but I was willing to accept it because the corporate welfare model that was in place before nationalization wasn’t exactly working either. But can anyone explain to me how, while the bank financing my pre-nationalization student loans can send me a consolidated statement listing all of my deferred accounts in a single letter, the federal government feels compelled to send me individualized letters in quadruplicate? Hope to have something law-related to write about soon Until then, have a great night! (1) Back in undergrad at N.C. State I had a PO Box that I used for all of my mail, so nothing got lost while I changed residence halls over the last four years. Then in August when I moved to Durham I got a new license with my new address, and submitted a forwarding order to the postal service to forward my mail. The USPS has done so without incident since I moved. (3) Back in February I had a 4-day lapse in my auto insurance coverage. The catalyst was innocuous enough — amid mailing off about a dozen things, I forgot to put a stamp on the envelope to the Farm Bureau The letter got returned to me, I realized what happened, then called the insurance office and had them do a payment via phone. With the premium paid my insurance was back in effect, but still had a lapse spanning that weekend through the morning following my phone call. Like most states North Carolina requires drivers to maintain liability insurance in order to operate a motor vehicle. If insurance coverage lapses at any time, the insurance company is obligated to notify the Division of Motor Vehicles. I’ve since learned that the DMV then (purportedly) notifies the driver that a lapse was reported and the driver is required to pay a fine or have their registration revoked. I had no clue there was even an issue with my vehicle registration until I went online to renew my tags before my mini-vacation to Virginia Beach. After clicking the submit button to renew, I got an error notice that renewal wasn’t possible. But the error had no mention of revoked plates: instead it said I couldn’t renew until my car was re-inspected, part of a law change last year where car inspections now take place the same month as registration renewals. So I went and got the car inspected the day before I left, enjoyed myself on the break, and came back on Monday. I waited the week to make sure the mechanic had plenty of time to update whatever database the state uses to monitor inspections. Then the following Sunday — a week ago today — I went online to again try and renew my registration. It particularly frosted my Wheaties because I had just done a boatload of legal research on driving privileges for one of my final exam questions in my Race and the Law class a couple weeks ago. Although driving is a privilege and not a fundamental right, once something like a vehicle registration is conferred it creates a property interest that can’t be taken away without due process. The due process standard is fairly low nationwide but always includes some level of notice prior to the revocation. And here I was being “notified” by an error generated by an automated registration renewal system, with no opportunity to contest the revocation before it happened. (1) Division correction. – If the owner responds within the required time and the response establishes that the owner has not had a lapse in financial responsibility, the Division shall correct its records. a. The owner had a lapse in financial responsibility, but the owner now has financial responsibility. b. The vehicle was not involved in an accident during the lapse in financial responsibility. c. The owner did not operate the vehicle during the lapse with knowledge that the owner had no financial responsibility for the vehicle. a. The owner had a lapse in financial responsibility and still does not have financial responsibility. b. The owner now has financial responsibility even though the owner had a lapse, but the vehicle was involved in an accident during the lapse, the owner operated the vehicle during the lapse with knowledge that the owner had no financial responsibility for the vehicle, or both. (4) Revocation pending response. – If the owner does not respond within the required time, the Division shall revoke the registration of the owner’s vehicle for the period set in subsection (c) of this section. When the owner responds, the Division shall take the appropriate action listed in subdivisions (1) through (3) of this subsection as if the response had been timely. (c) Revocation Period. – The revocation period for a revocation based on a response that establishes that a vehicle owner does not have financial responsibility is indefinite and ends when the owner obtains financial responsibility or transfers the vehicle to an owner who has financial responsibility. The revocation period for a revocation based on a response that establishes the occurrence of an accident during a lapse in financial responsibility or the knowing operation of a vehicle without financial responsibility is 30 days. The revocation period for a revocation based on failure of a vehicle owner to respond is indefinite and ends when the owner responds. Various emphases added by me. With the statutory language in front of me, I called the DMV on Monday as soon as the office opened. The lady I spoke to told me the DMV had sent me notice. Five notices, in fact: she claimed the DMV mailed four separate letters, and a postcard to boot. When I told her I hadn’t received any of them, she asked for my address which I provided. She then told me the DMV had been sending notices to my old PO Box in Raleigh, and that the confusion was my fault for not updating my mailing address. The situation and her attitude made me want to reach through the phone and strangle someone. I figured my mailing address would have been updated when I got my new license back in August. But, even assuming the DMV didn’t use my new residence as my new mailing address and it was my fault for not updating them accordingly, that means the USPS would have had to not forward five separate mailings spanning over a month… even though they’ve successfully forwarded all of my other correspondence without a problem. Even if I thought the USPS was the single most incompetent government enterprise to exist (I don’t), the idea that they selectively didn’t forward material from one particular correspondent on five separate occasions is just preposterous in its implausibility. The far more likely scenario, to my enfeebled mind at least, is that the NC DMV never actually sent the notices or has “Do Not Forward” printed across the front of the envelopes. Anyhow, trying to contain my total disbelief and figure out how to get my registration renewed, I’m told by the bureaucrat that I’d have to contact my insurance company, have them send a Form FS-1 to the DMV notifying them I had active insurance (bear in mind I’ve been regularly paying my premiums since the 4-day lapse 5 months ago), then call back 2-3 days later to request a hearing on the revocation. I mention the statutory language to her, and she repeats that I need to have the Form FS-1 sent in and call back to demand an administrative hearing. I contact my insurance agent and the Form FS-1 is faxed to the DMV less than an hour later. I call the DMV back the next morning en route to my Medicaid mediation, talk to a different bureaucrat who verifies the FS-1 has been received, and again mention the plain language of the N.C. General Statutes that my revocation should end and I be allowed to pay my civil penalty and move on with my life. The second bureaucrat asks if I’d like to demand a hearing (I do) and then tells me I’ll receive a notice in 2-3 weeks scheduling a hearing date 2-3 weeks after that. She then tells me that if I need to operate the motor vehicle I should go buy a temporary 30-day tag. "Dear TDot: You were right. Oops. Sincerely, NCDMV"
Terrified something could happen and I get pulled over in an unlicensed vehicle, I go to the DMV in between the two Medicaid hearings and drop $63 on a 30-day tag as instructed. I then spend the rest of the week waiting for a letter telling me when my hearing will take place. I got the letter on Saturday, which I took the liberty of scanning in for y’all to read if you’re interested. Essentially the DMV agrees that the statutory language I pointed out to them was right, and in fact I don’t need a hearing at all. I just have to pay the civil penalty and move on with my life… the exact same thing I was trying to do on the phone with the apparently-less-than-competent DMV personnel. Now I have no objection at all to being required to pay a civil penalty for the insurance lapse. We live in a society where people get penalized for their carelessness to teach them a lesson; I was careless in not putting a stamp on the envelope, I’m fine being penalized for it, and it won’t happen again. Not getting an indication about the plate revocation the first time I attempted to renew my plates online, instead only being notified that I needed to get my car inspected. Solely because of the DMV’s negligently-coded website I drove in a vehicle with revoked plates across two separate states spanning five separate days; had I known the plates were revoked, 雅雅 and I could have just taken her car. It’s only by the grace of God that I didn’t get pulled over or in a car accident that would have had far broader repercussions. My registration being revoked in the first place without any kind of notice at all whatsoever from the DMV. The notion that the USPS selectively failed to forward 4 separate letters and a postcard spanning several weeks — when they’ve forwarded all of my other bills and other correspondence without an issue — is simply too implausible to be believed. The DMV arguing the lack of notice is my own fault for not updating them with my new mailing address… when they got my new mailing address on my new license I obtained in August. If a driver with a mostly-unblemished record hasn’t responded to numerous notices purportedly sent to a (older) mailing address, doesn’t it make sense to send at least one of the notices to the person’s (newer) address on their license? Being told by two separate bureaucrats that I’d need to demand a hearing to review the revocation, despite the plain language of the statute I provided to them indicating no such hearing was needed. Being given a series of hoops to jump through before I could even demand the hearing I didn’t need. Having to spend $60+ on a 30-day temporary tag that I only had to buy because the NC DMV apparently doesn’t know the laws it operates under. 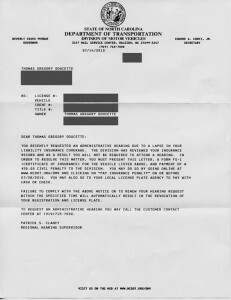 Had I gotten a notification in the mail before the revocation, or a notice on the website when I attempted to renew my registration on July 1, or an acknowledgement that the revocation was temporary when I talked to a live bureaucrat on July 12, or even gotten the letter they sent on or before July 15, I would have had enough time to renew my registration without the wasted money and time spent buying the temporary tag. Unfortunately the N.C. General Assembly has already adjourned for the year, because otherwise I’d be in downtown Raleigh raising hell that this level of pervasive, multi-faceted incompetence is allowed to take place in a government agency. This isn’t like a private marketplace where I can switch vendors if the one I’m using turns out to be incompetent — I have no choice but to register my vehicle with the NC DMV if I want to live and drive in North Carolina. So I expect better of a monopolistic enterprise funded by my tax dollars. Do better, N.C. Division of Motor Vehicles. Do better. I’m not sure how many of you are familiar with The Atlanta Post, but it’s essentially a website blending both news aggregation and original content geared to “inform, educate, and motivate African-Americans.” Even if you’re not part of TAP’s target demographic, there’s plenty of info on the site worth a read. One example is their listing (published yesterday) of the Top 10 historically black colleges and universities in the country. There are roughly 90ish four-year HBCUs spread across 21 states and the U.S. Virgin Islands, and about 40 of them are public institutions. And only 1 public HBCU made TAP’s Top 10 list. The only public college in this top-ten list, North Carolina Central University represents an unbeatable opportunity for prospective students to receive a high quality education at only a tiny fraction of the price of other similarly-ranked institutions. With a wide range of undergraduate, graduate, professional, and doctorate degree tracks, NCCU has something to appeal to everyone, including Business and Law programs and ample hands-on research opportunities. Overall, North Carolina Central University offers an unparalleled cost-benefit ratio among HBCUs, making it an attractive option for anyone reluctant to accrue large debts yet not wanting to compromise education quality.